This past week we did something we have rarely done over the course of our lives – gone to the fair! Above and beyond that… we even entered something in the fair, and came away with ribbons! WooHoo! In April, we bought a couple working hives of bees, and more or less on a whim, decided to enter some honey, a frame of honey (the comb with the honey still inside) and some photos I took of the bees the first time we got into the hives. And we placed in a couple categories! So the other day we went to see our “prize-winning” entries and walk around and see the sights. It was a lot of fun, and we really enjoyed talking to some of the other exhibitors that were incredibly passionate about their fields of specialty. For instance… this giant (super soft) bunny rabbit…. Or these chickens… There literally must have been over 1000 chickens in one pavilion!!! Who knew there were so many varieties of them? Not me. Or how about these eggs? Some – from chickens – were about the size of a chocolate truffle, and others were larger than turkey eggs. They came in all colors, but my favorites were the deepest brown mahogany I’ve ever seen. And then there was an abundance of all kinds of fruits and vegetables. After having not eaten for most of the day, and having given blood right before we went to the fair, it was all I could do not to swipe a few cucumbers and tomatoes and tuck into them! One of our favorite parts, though, was talking to the man who grew these giant watermelons, sunflowers and pumpkins. Not to win prizes, but just to show others that it could be done without much trouble. The pumpkin here weighed in at 1199 lbs, and with the rain we got this summer and 6 other waterings, grew by 45 lbs a day! The watermelon weighed grew about 6 – 8 lbs per day. The gentleman we talked with was so enthusiastic about how and why he grew giant vegetables that it was kind of infectious. Except… I couldn’t imagine having to MOVE one of those! There were also sculptures and biscuits and quilts and Lego models entered into competition. And of course, fried foods too! 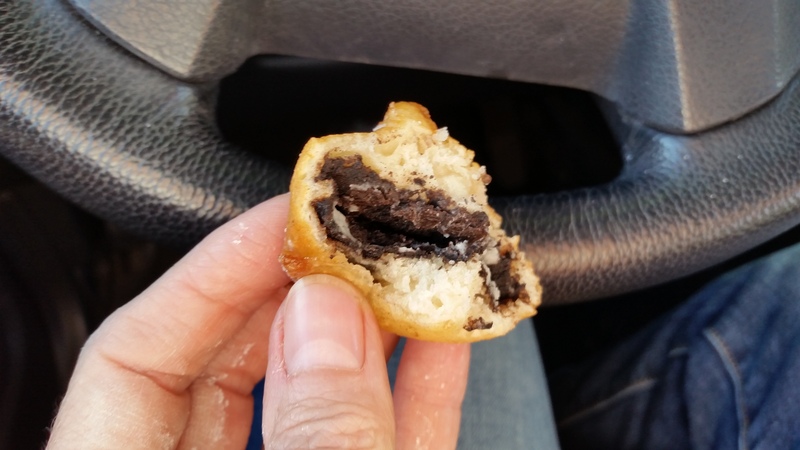 Which, I have to say, after having heard so much about them for so many years, we broke down and bought some fried Oreos! After all… I had just given blood and I need a boost of energy! 🙂 In all honesty, though, I think I like just plain Oreos better than fried ones! Maybe it’s the homeschooler in me, but I love this stuff. I love learning and seeing what people are interested in. What they do as hobbies and for businesses. Learning is good for you! A couple raises a baby koala – adorable! Make cheese in your microwave! Transform unripe avocados to ripe ones in 2 hours! Can you be a perfectionist and still be happy? I keep hearing and reading about this salad. I’m going to have to try it! Soon!